Waalko Jans Dingemans Jnr was born in Gorinchem NL in 1912, son of Waalko Jans Dingemans Sen. (1873-1925) and Henriette Gensiina Dingemans-Numans (1877-1955), both artists. 1929-1934 studied in Amsterdam at the Rijksmuseum School of Art and the Rijksakademie van Beeldende Kunsten; further studies in 1937 in Paris. 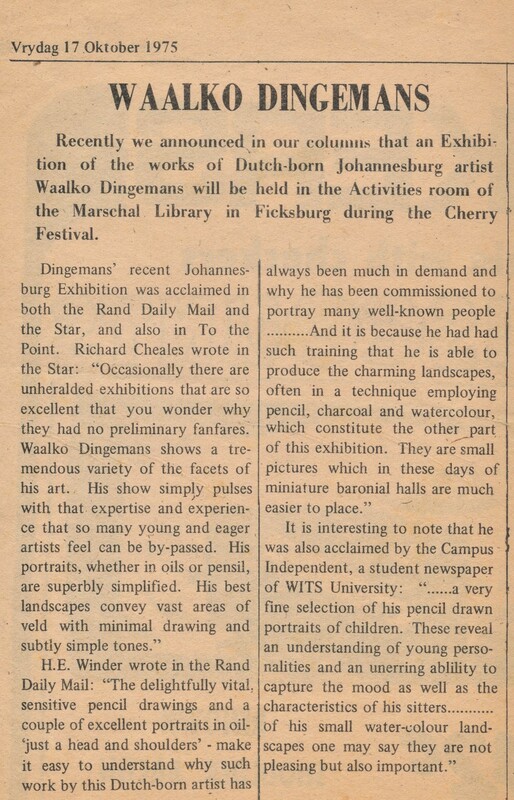 going around Southern Africa on an extended painting expedition until July, 1950.
holding on his return a solo show at the Gainsborough Galleries, Johannesburg (25th October, 1949); in 1950, on a brief visit to Rhodesia, he was commissioned to paint official portraits. He returned to The Netherlands in August, 1950 and only came back to South Africa in December, 1952 after his marriage in July that year to Elizabeth Florence Hipwell in Navan, Ireland. the H.A.U.M. 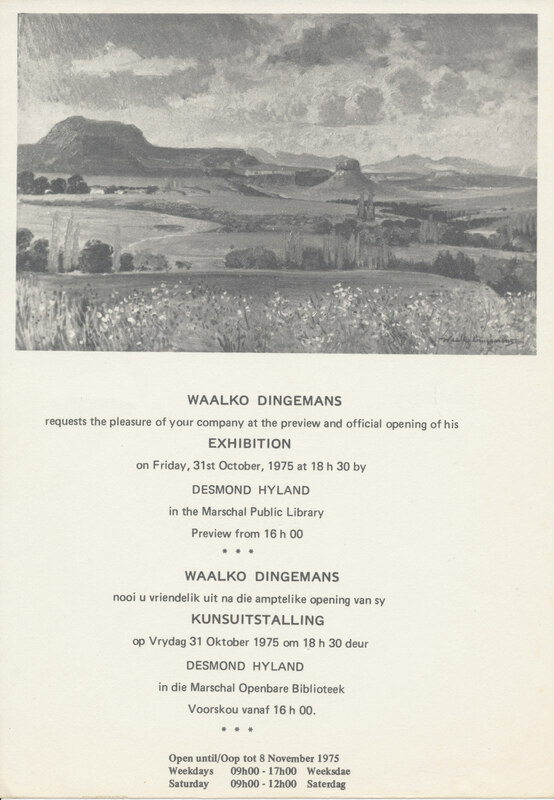 Gallery, Cape Town (22nd September, 1953), the Gainsborough Galleries, Johannesburg (17th August, 1954). 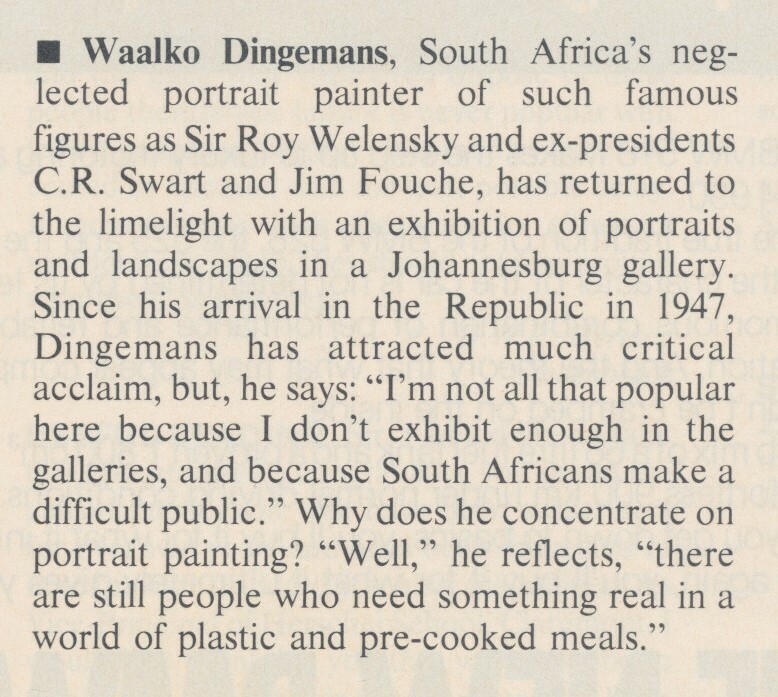 In 1955 Waalko completed official portrait commissions in Salisbury/Harare, Rhodesia/Zimbabwe. Waalko Jans Dingemans Jnr returned in 1978 to live in the family home in Westerschouwen, Zeeland NL, where he continued to paint and exhibit. Waalko Jans Dingemans Jnr died in 1991 in Westerschouwen NL.